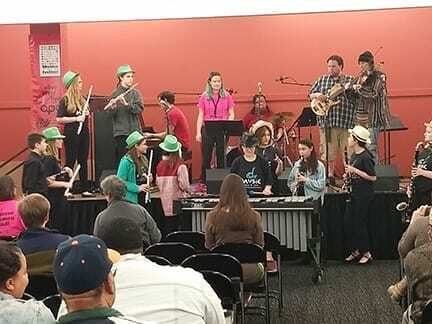 Children from Hamblen County : 7th and 8th graders perform during the festival. mission: to enjoy some of the finest women musicians from the region. 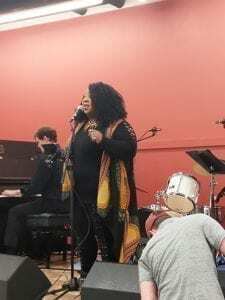 The Friday night jam session, the first of a two day event did not start until 6 pm. However, by 530, the venue was already half full and would reach maximum capacity within 30 minutes of the show. The steady flow of followers of these fantastic musician’s and singers would continue all day and into the sunset on Saturday at the Knoxville Center Mall. 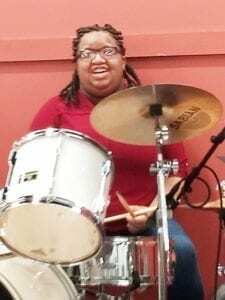 The weekend featured jazz singers, musical instruments of all types, original compositions, poetry set to music, a group performance and introduced one of Knoxville’s finest drummers; a rarity in the field, Faith Harris who turned it out on Saturday with her fantastic drumming skills. 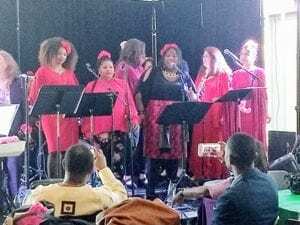 Women in Jazz singers perform at the Knoxville Museum of Art. School, and Lincoln Heights Middle School from Hamblen County in Morristown Tennessee.